Until recently, being paralyzed from the waist down meant using a wheelchair to get around. And although daily life is more accessible to wheelchair users, they still face physical and social limitations. But UC Berkeley's Robotics and Human Engineering Laboratory has been working to change that. The robotics lab, a team of graduate students led by mechanical engineering professor Homayoon Kazerooni, has been working for more than a decade to create robotic exoskeletons that allow those with limited mobility to walk again. This week, a new, lighter and more agile exoskeleton, for which the Kaz lab developed the original technology, was unveiled earlier this week: The Phoenix, by SuitX, a company that has spun off the robotics lab. Kazerooni is its founder and CEO. The Phoenix is lightweight, has two motors at the hips and electrically controlled tension settings that tighten when the wearer is standing and swing freely when they're walking. Users can control the movement of each leg and walk up to 1.1 miles per hour by pushing buttons integrated into a pair of crutches. It's powered for up to eight hours by a battery pack worn in a backpack. "We can't really fix their disease," says Kazerooni. "We can't fix their injury. But what it would do is postpone the secondary injuries due to sitting. It gives a better quality of life." Kazarooni and his team have developed a series of exoskeletons over the years. Their work in the field began in 2000 with a project funded by the Defense Advanced Research Projects Agency to create a device, now called the Berkeley Lower Extremity Exoskeleton (BLEEX), that could help people carry heavier leads for longer. At that time, Kazerooni also realized the potential use for exoskeletons in the medical field, particularly as an alternative to wheelchairs. The team began developing new devices to restore mobility for people who had become paraplegic. In 2011, they made the exoskeleton that helped Berkeley senior Austin Whitney, paralyzed from the waist down in a 2007 car accident, make an epic walk across the graduation stage to receive his diploma. Soon after, the Austin Project was created in honor of Whitney, with a goal of finding new technologies to create reliable, inexpensive exoskeleton systems for everyday personal use. 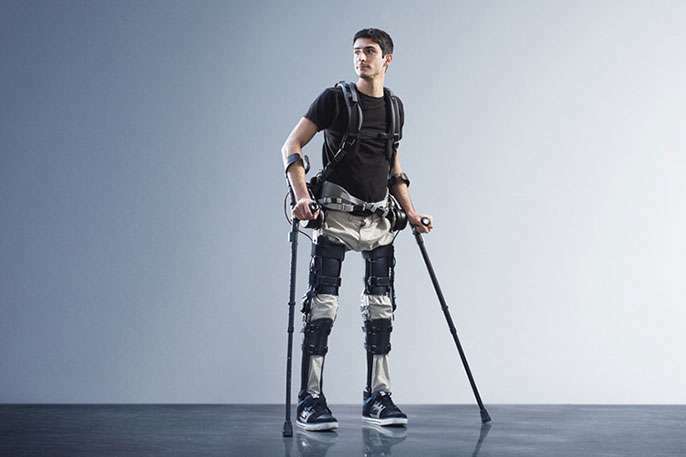 Today, the Phoenix is one of the lightest and most accessible exoskeletons to hit the market. It can be adjusted to fit varied weights, heights and leg sizes and can be used for a range of mobility hindrances. And, although far from inexpensive at $40,000, it's about the half the cost of other exoskeletons that help restore mobility.